Lord Mayor's Charitable Foundation, a charitable community foundation established in 1923, introduced a new brand identity and positioning in 2013 of 'inspiring philanthropy'. This new brand identity has helped establish a reputation for being an innovative and contemporary charitable organisation. 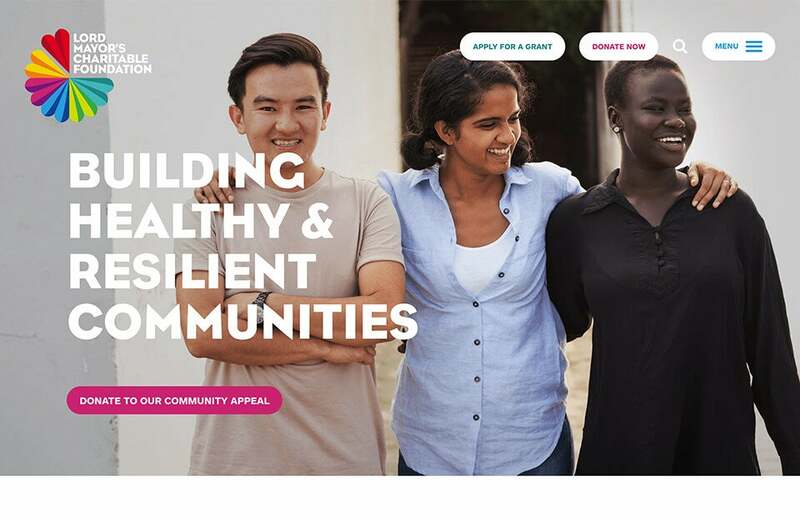 Now, as a leader within the Australian philanthropic sector with the brand promise of 'inspiring philanthropy' firmly entrenched in the organisational culture, the Lord Mayor's Charitable Foundations required a website to engage a new audience. Key to this was the ability to meet the perception of the brand promise and set in place a path towards building a rewarding and lifelong association with their audience and donors. The Lord Mayor's Charitable Foundation was concerned that the web architecture, front-end web technologies, user experience, social media integration and online fundraising capabilities of the previous website were falling well below the expectation of a current non-for-profit website. Also, the processes in place to maintain and update site content were slow and resource intensive. Interesting upgraded the site to the latest version of Kentico (v.10 CMS) with a new site architecture and set of responsive front-end site templates. Created a vibrant, visual and actionable site experience that is both a giving and knowledge destination for their stakeholders. Produced and implemented a new content strategy that surfaced the Foundations 'Impact areas' to drive fundraising and grant-giving opportunities. Provided Google Analytics consultancy and best practice implementation. Designed content workflows that enable the Foundation to incorporate newly created, dynamic and streamlined content. Integrated with the Foundation's new Microsoft Dynamics CRM system. One of the most significant challenges was the creation and implementation of a new editorial content strategy. Interesting conducted a content audit and competitor landscape assessment to identify areas that would centre the website activities around the Foundations four impact areas: Education & Employment, Environment & Sustainability, Healthy & Resilient Communities and Homelessness & Affordable Housing. 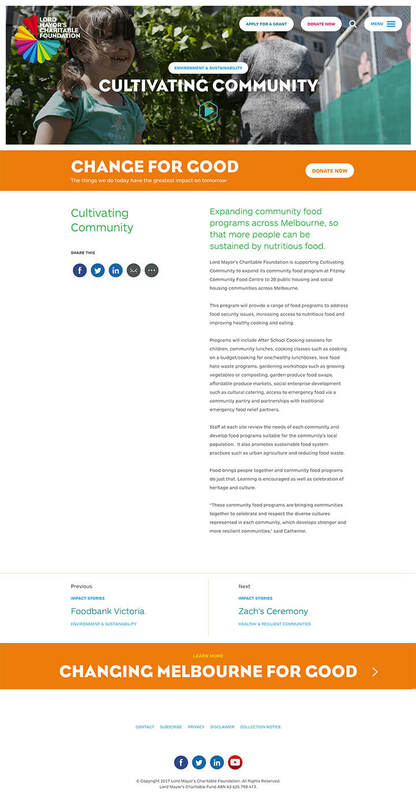 These efforts evolved into a content framework that would promote the Foundation's philosophy to inspire action with tangible results, seamlessly translate to the smaller screen with clarity, provide transparency of the role the Foundation plays in the funding and grant-giving process and invite participation for those with a role to play. Finally, an important step was fast-tracking access to the CMS admin interface and content templates allowing the LMCF editorial team time to perform a significant content update without impacting critical delivery timelines. At the time of writing (3 months after launch) The Lord Mayor's Charitable Foundation had seen excellent results that point to higher engagement, lower bounce rates, a x4 increase in mobile traffic and SEO improvements despite a considerable content rewrite.